You'll be £12.99 closer to your next £10.00 credit when you purchase Tracing Your Great War Ancestors: The Gallipoli Campaign. What's this? Do you have an ancestor who served in the Gallipoli campaign in the First World War? Perhaps you have thought of visiting the battlefields in Turkey and the monuments that commemorate them, and want to find out exactly where and when your ancestor served and what part he played in the landings and the fighting that followed? This practical and informative handbook is an ideal guide to the struggle for the Gallipoli peninsula and the stories of the men who took part in it. Simon Fowler outlines the course of the campaign and introduces the many historical resources that you can use to explore the history for yourself. He identifies the key sources for family historians, including The National Archives in Britain, the Australian War Memorial, and other sources in Australia and New Zealand and the many websites that researchers can turn to, and he gives advice on the literature, archives, museums and monuments that may help you to gain an insight into your ancestor's story. This edition in the Tracing your Great War Ancestors series gives researchers a comprehensive guide to available resources on Gallipoli. This is a very worthwhile read. A useful practical guide with which readers will be able to explore and learn about the service lives on ancestors who fought on the land in Gallipoli and at sea in the Dardanelles. This informative and moderately priced volume will certainly provide valuable material to the relatives of the 500,000 soldiers and sailors who served at Gallipoli. Part of the popular Tracing Your Ancestors series, these practical and informative handbooks are ideal guides for those whose ancestors served in the Gallipoli campaign of WWI. This book is part of a series by well known genealogy expert Simon Fowler. Their aim is to help the family historian trace a relative who served in a particular battle or campaign, and give them some wider context to make sense of what they did in that action. This excellent Gallipoli volume starts with an overview of the Gallipoli Campaign, takes some examples of what soldiers did at Gallipoli and then chapters follow which give a lead in how to research those who took part in the fighting here in 1915. The Royal Navy is covered as well as the army, and there is also a chapter on Commonwealth troops. The book ends with some leads on visiting the Gallipoli battlefields. 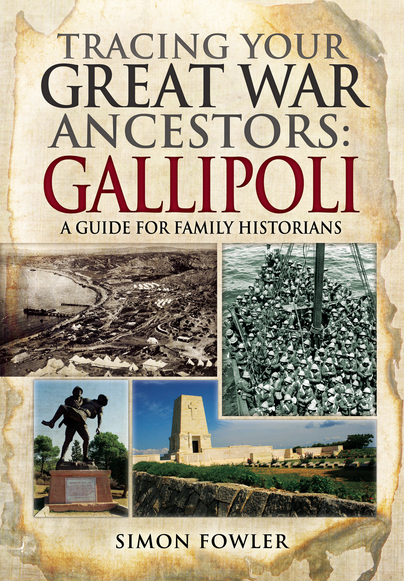 An excellent one-stop volume giving useful context and excellent information on researching your Gallipoli ancestors. Highly recommended. The book provides a detailed guide to researching individual soldiers and sailors at Gallipoli and the units and ships with which they served. This practical and informative handbook is an ideal guide to the struggle for the Gallipoli peninsula and the stories of the men who took part in it. Furthermore, it is a fascinating introduction to researching the Great War as a whole.